Rob Harbron and Emma Reid are both highly regarded traditional musicians who hail from the north of England. 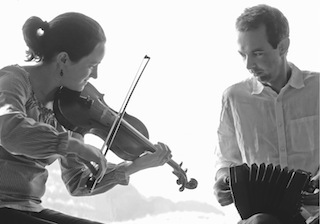 Their duo performances bring together individual influences and expertise with shared roots in English traditional music. Rob performs with the acclaimed English Acoustic Collective and is a sought-after composer and teacher. He is known for his unique concertina style, and is an assured performer, a consummate accompanist and an engaging singer. Emma is currently based in her motherland Sweden where she studied Swedish folk music performance at Stockholm’s Royal College of Music. Emma is a truly natural fiddle player, with a deeply personal style and a real ability to speak through her fiddle. She regularly performs and teaches in the UK, Scandinavia and the USA. Together Rob and Emma bring a natural, uplifting sound to bear on a varied repertoire which includes their own new music alongside traditional songs and tunes. The heart of the repertoire is in the dance tunes of England, which they bring to life and adapt to the stage, inspired by archive recordings and contemporary musicians to expose the vitality, swing, lift and articulation at the core of each tune. This is honest, upbeat, optimistic music to listen to in an intimate, acoustic setting – where the audience can enjoy the intricate details, spontaneous harmonies and arrangements that stem from a close interplay between the players, and the ongoing dialogue between artist and audience. 2015 will see the release of the duos’ second album, in which they playfully explore similarities between Swedish and English dance forms.